but "THE INTERNET ATE MY OLD POST"
LOCKED out for weeks or what??? 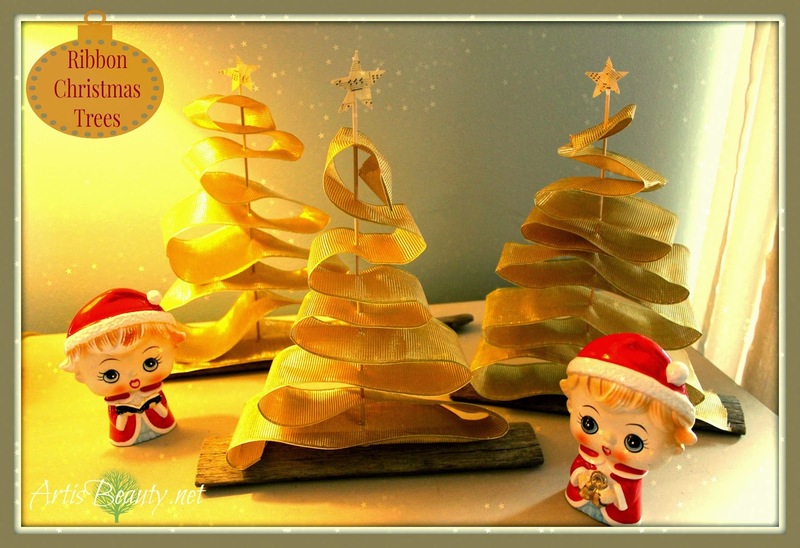 To show you how to make RIBBON TREES for Christmas. They even have my old Watermarks on them. I simply drilled a small hole in my wood and dropped some glue in the hole to help stabilize the post. But DON'T do the GLUE yet!!!! You need to be able to keep the skewer out for a bit while using your ribbon. without it glued into the base yet. I gathered my ribbon and laid it out like a folded flat Christmas tree. This is the easiest way I have found to work this out. gather that by how long your skewer is and how many folds you want in your tree. Once you are happy with the overall shape you can NOW GLUE your post in. let it sit and when the glue is dry you can start working the ribbon into how you want it. paper and glued them onto the skewers. Some cute little ribbon Christmas trees.